For other people named Sam Hopkins, see Samuel Hopkins. For the R.E.M. song, see Document (album). Samuel John "Lightnin'" Hopkins (March 15, 1912 – January 30, 1982) was an American country blues singer, songwriter, guitarist and occasional pianist, from Centerville, Texas. Rolling Stone magazine ranked him number 71 on its list of the 100 greatest guitarists of all time. The musicologist Robert "Mack" McCormick opined that Hopkins is "the embodiment of the jazz-and-poetry spirit, representing its ancient form in the single creator whose words and music are one act". Hopkins was born in Centerville, Texas, and as a child was immersed in the sounds of the blues. He developed a deep appreciation for this music at the age of 8, when he met Blind Lemon Jefferson at a church picnic in Buffalo, Texas. That day, Hopkins felt the blues was "in him". He went on to learn from his older (distant) cousin, the country blues singer Alger "Texas" Alexander. 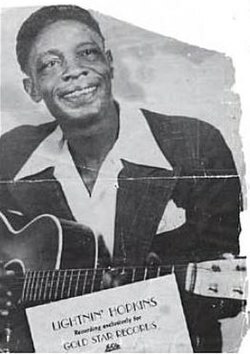 (Hopkins had another cousin, the Texas electric blues guitarist Frankie Lee Sims, with whom he later recorded.) Hopkins began accompanying Jefferson on guitar at informal church gatherings. Jefferson reputedly never let anyone play with him except young Hopkins, and Hopkins learned much from Jefferson at these gatherings. In the mid-1930s, Hopkins was sent to Houston County Prison Farm; the offense for which he was imprisoned is unknown. In the late 1930s, he moved to Houston with Alexander in an unsuccessful attempt to break into the music scene there. By the early 1940s, he was back in Centerville, working as a farm hand. Hopkins took a second shot at Houston in 1946. While singing on Dowling Street in Houston's Third Ward (which would become his home base), he was discovered by Lola Anne Cullum of Aladdin Records, based in Los Angeles. She convinced Hopkins to travel to Los Angeles, where he accompanied the pianist Wilson Smith. The duo recorded twelve tracks in their first sessions in 1946. An Aladdin executive decided the pair needed more dynamism in their names and dubbed Hopkins "Lightnin'" and Wilson "Thunder". Hopkins recorded more sides for Aladdin in 1947. He returned to Houston and began recording for Gold Star Records. In the late 1940s and 1950s he rarely performed outside Texas, only occasionally traveling to the Midwest and the East for recording sessions and concert appearances. It has been estimated that he recorded between eight hundred and a thousand songs in his career. He performed regularly at nightclubs in and around Houston, particularly on Dowling Street, where he had been discovered by Aladdin. He recorded the hit records "T-Model Blues" and "Tim Moore's Farm" at SugarHill Recording Studios in Houston. By the mid- to late 1950s, his prodigious output of high-quality recordings had gained him a following among African Americans and blues aficionados. In 1959, the blues researcher Mack McCormick contacted Hopkins, hoping to bring him to the attention of a broader musical audience engaged in the folk revival. McCormack presented Hopkins to integrated audiences first in Houston and then in California. He made his debut at Carnegie Hall on October 14, 1960, alongside Joan Baez and Pete Seeger, performing the spiritual "Mary Don't You Weep". In 1960, he signed with Tradition Records. The recordings which followed included his song "Mojo Hand" in 1960. In 1968, Hopkins recorded the album Free Form Patterns, backed by the rhythm section of the psychedelic rock band 13th Floor Elevators. Through the 1960s and into the 1970s, he released one or sometimes two albums a year and toured, playing at major folk music festivals and at folk clubs and on college campuses in the U.S. and internationally. He toured extensively in the United States and played a six-city tour of Japan in 1978. Hopkins was Houston's poet-in-residence for 35 years. He recorded more albums than any other bluesman. Hopkins died of esophageal cancer in Houston on January 30, 1982, at the age of 69. His obituary in the New York Times described him as "one of the great country blues singers and perhaps the greatest single influence on rock guitar players." His Gibson J-160e "hollowbox" is on display at the Rock Hall of Fame in Cleveland, and his Guild Starfire at the National Museum of African American History and Culture in DC, both on loan from the Joe Kessler collection. Hopkins's style was born from spending many hours playing informally without a backing band. His distinctive fingerstyle technique often included playing, in effect, bass, rhythm, lead, and percussion at the same time. He played both "alternating" and "monotonic" bass styles incorporating imaginative, often chromatic turnarounds and single-note lead lines. Tapping or slapping the body of his guitar added rhythmic accompaniment. Much of Hopkins's music follows the standard 12-bar blues template, but his phrasing was free and loose. Many of his songs were in the talking blues style, but he was a powerful and confident singer. Lyrically, his songs expressed the problems of life in the segregated South, bad luck in love and other subjects common in the blues idiom. He dealt with these subjects with humor and good nature. Many of his songs are filled with double entendres, and he was known for his humorous introductions to songs. A statue of Hopkins sits in Crockett, Texas. Hopkins is mentioned in Erykah Badu's 2010 "Window Seat": "I don't want to time-travel no more, I want to be here. On this porch I'm rockin', back and forth like Lightnin' Hopkins." R.E.M. 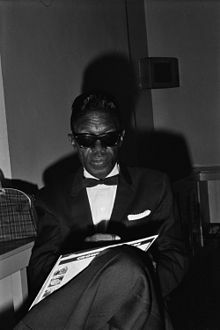 included the song "Lightnin' Hopkins" on their 1987 album Document. Hopkins's song "Back to New Orleans (Baby Please Don't Go)" was performed by the fictional country singer Cherlene in the FX television comedy Archer (season 5, episode 1).The rock band AC/DC also covered the song. As of 2010[update], a film documentary on Hopkins, Where Lightnin' Strikes, was in production with Fastcut Films of Houston. His song "Once a Gambler" is on the soundtrack of the 2009 film Crazy Heart. ^ Eagle, Bob; LeBlanc, Eric S. (2013). Blues: A Regional Experience. Santa Barbara, California: Praeger. p. 294. ISBN 978-0313344237. ^ "Lightnin' Hopkins | Rolling Stone Music | Lists". Rollingstone.com. Retrieved 2010-08-09. ^ a b c d Russell, Tony (1997). The Blues: From Robert Johnson to Robert Cray. Dubai: Carlton Books. p. 64. ISBN 1-85868-255-X. ^ Nicholas, A. X. (1973). Woke Up This Mornin': Poetry of the Blues. Bantam Books. p. 87. ^ Dahl, Bill. "Frankie Lee Sims: Biography". AllMusic.com. Retrieved 2010-10-19. ^ Saxon, Wolfgang (February 1, 1982). "Obituary: Sam (Lightnin') Hopkins, 69; Blues Singer and Guitarist". New York Times. Retrieved November 11, 2012. Stambler, Irwin; Landon, Grellun (1983). The Encyclopedia of Folk, Country & Western Music (2nd ed.). St. Martin's Press. ISBN 0-312-24818-0. Liner notes to the CD Country Blues, Ryko/Tradition Records. Campstreetcafe.com. Accessed December 25, 2007.